Dr. Dane Becker with his family. Before embarking on a career in chiropractic, I received an undergraduate degree in Exercise Science from Nebraska Wesleyan University. It was there that my interest and passion for chiropractic began. After suffering a football injury, I experienced firsthand the healing benefits of chiropractic care. My experience led me to shadow a chiropractor, and it was this experience that influenced my decision to pursue a career in chiropractic. After graduating from Texas Chiropractic College, I came back to Nebraska, where I was born and raised. I settled in Omaha to be near family and because it’s a great place to raise my own family. It’s been a privilege to serve the community since 2008. Dr. Dane Becker was inspired by this experience because he could see what a real difference chiropractic care can make in a person’s life. He began Becker Chiropractic and Acupuncture with the goal of helping people feel better and live healthier lives. 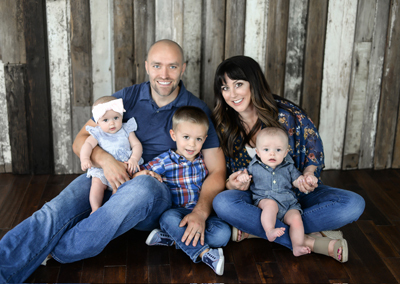 When Dr. Dane Becker is not at the office, you can find him spending time with his family that includes his wife Mandi, son Colson, and twins Lyla and Liam with their two dogs. He also enjoys sports, especially playing basketball and golf. Dr. Dane Becker and his family are also active in their church. If you’re ready to start feeling better and living healthier, contact us today for an appointment! We offer free parking and on-site X-rays.